The files below are Excel spreadsheet files which you can download and then open in your Excel spreadsheet. To download the files, create a folder on your drive in which to save the files. Point to a one of the links below and right mouse click. Select Save or Save Target As or Save Link As and a File Download dialogue box similar to the one on the right should appear. 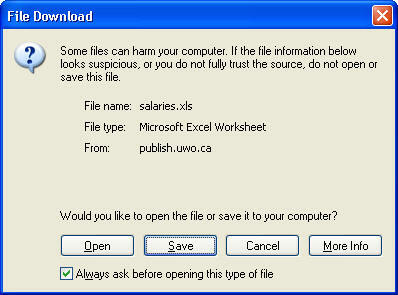 Locate the folder in which you wish to save the file and click on Save or OK.
Do not click on the Open button. This will open the spreadsheet in a viewer and you will not be able to perform calculations. For these activities, open your Excel spreadsheet, locate the folder where you save the files and open the spreadsheet file. Examine the Worksheet tabs at the bottom of the page. The first tab will give you instructions. The second tab will give you a hints to solve the problem. The third tab will give a sample answer.